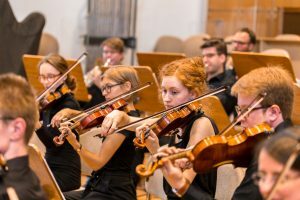 The Collegium musicum Bonn Symphony Orchestra provides the opportunity for all students of the University of Bonn and a lot of other passionate young musicians to gather together and to dedicate themselves to symphonic music. In every term, we rehearse orchestral works from different musical periods and perform them in several public concerts, usually at the end of semester. Interested musicians are welcome to join us at the beginning of each semester, i.e. usually in October and April. Apart from our weekly rehearsals on Wednesday night we also spend up to two rehearsal weekends per term, which are very essential for our musical work. We get to know each other better and develop a sense of community which is rather pleasurable as well! Furthermore, we engage in regular cooperation with the Choir of the Collegium musicum Bonn. As a recent project, we performed Schubert’s Mass No. 6 in E flat major in January 2018. The Collegium musicum Bonn has a grand tradition at the University of Bonn. It was founded 65 years ago in 1953 by Prof. Dr. Emil Platen. Its history is characterised by numerous concerts in Germany as well as a variety of other countries, for example South Korea, Cyprus, Egypt and the United Kingdom.